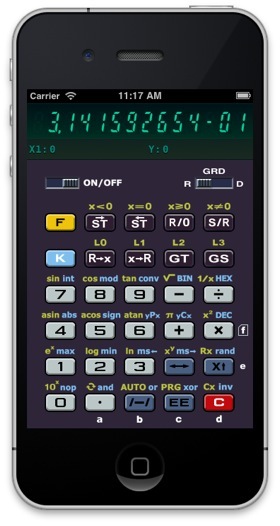 The MK61+ application is a programmable RPN calculator, based on the Electronika MK 61 calculator, that was produced in 80-90s of the last century. This is not an exact emulator of the original MK61. The goal is to get a handy tool to use on daily basis. So, some extra functionality was added, that was absent in the original MK 61 calculator, and some its quircks were fixed. Quick State¹ panel to get easy insight into calculator's state. ¹ To show Quick State panel swipe to bottom on the display. ² To get Quick Help for a button, switch, or the display tap it with finger and hold for ~3 seconds. ³ Hexadecimal and binary numbers can contain up to 10 digits. We don't collect any of your privacy data. Point to the image to start slideshow. Copyright © 2011-2019 Aleksandr Skobelev.